It seems Marvin's 20 meter FMT transmitter is working great. He had a very good signal in Oklahoma and his signal was measured with good accuracy by most. Several capitalized on the K5CM reference signal. W3JW, K6IQL, N7EP, and WB6BNQ all had zero error with AA6LK, VE2IQ, and W8XN having 5 millihertz or less error. It would seem, at least for these stations, that the Doppler was stable over at least 200 Hz of frequency difference. We will do more testing to see if these and other stations can duplicate these interesting results. Thanks to WB6BNQ, AB4RS, and KA1BQP for providing complete wave files and to WA1ABI for providing call up snips. AA6LK SV CM98kw I'll be lucky to get close this time, as I discovered after the test that my Z3801A had been in holdover mode for several hours and unable to acquire satellites. Used my error from the "reference" frequency to correct my entries. To add insult to injury, the PG&E pole tranformer that feeds my house began its yearly 3-week ritual of generating S9 hash when the outside temps are in the mid 80's. W6OQI was very weak but managed to pick him out during a brief lull in the din. AB4RS VA FM18hw Forgot to let my radio warm up and stabilize, so the AF slewed over about 1 Hz over the course of the test. Kind of makes it hard to do long, deep FFTs. 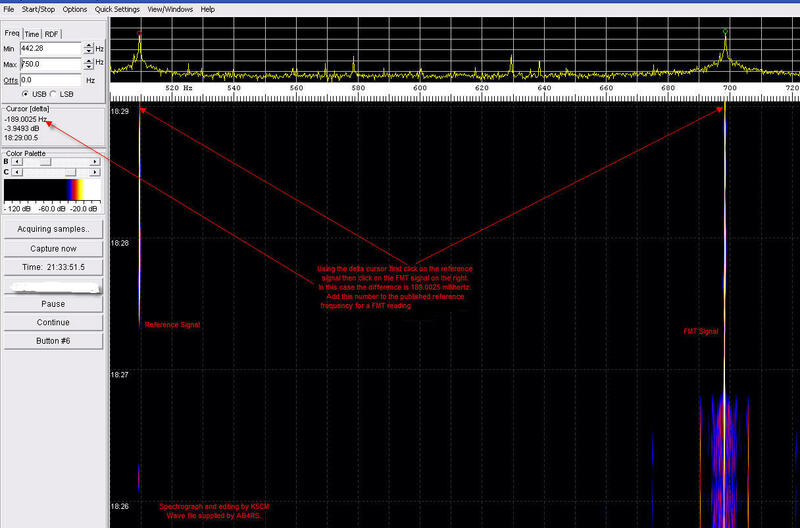 Delta reference method, using HP 3336C locked to 10MHz reference from Trimble Thunderbolt. Tuned to AF using Yaesu FT-897d, analyzed using SpectrumLab. Don't have particularly high expectations for my accuracy on this one. K6BZZ AZ DM33xb Good sigs from K5CM both directions. W6OQI sig very weak east and barely perceptible NW. I will be better prepared next time for a two tone test, if you do that again. Thanks for the FMT. KA1BQP RI FN41 Signals were good, although I almost lost Marvin when he pointed northwest. I picked the reference signal up on the wrong sideband. I had to do some fancy math to figure the correction factor. Measure with a micrometer, mark with chalk, cut with axe! Tnx Connie & Marvin for another great FMT. N2GL OR cn85kp Took average WWV reference readings before and after but finally used GPS 10 MHz as a reference. 80m dipole to GPS SLM to SpecLab. N4AU AL EM62vp Thanks guys for the practice. K5CM signals about the same level here and 26 mHz difference in calculations. W6OQI was very strong (S9+) with East signal but weak on NW signal. I had a difference in calculations on them of 57 mHz. Here using a KW TS570 with Speclab and spreadsheet. N8OB OH EN80ko Fun as usual and not on my Ham Radio Club meeting night. TS-2000 and Spectrum Lab software. NO5K STX EM10CM Nice test between the storms here. Now raining cats and mice. Interesting short burst on 14054688.072 early in W6OQI's transmission. Measured K5CM Ref Carrier: 14054499.969E and 14054499.977W. Good signals, the antennas was connected for this test. VE2IQ ON FN15nt Thought K5CM's east run was easy - then I looked at his west run, now I'm not sure anything is easy. W6OQI measured about same for east, west but I suspected a large negative doppler so added 400 milliHertz out of the blue. VE3OAT ON FN25eg Was able to hear all four transmissions. The signal in the NW beam from W6OQI appeared 500 mHz higher than his E beam. For K5CM the W beam signal was only 300 mHz higher than the E beam. W3GXT MDC FM19 Big SID's during the day upset the band. W5CM signal was fine. W6OQI was a no-show,I did not see any signal at all. Thanks for holding the event. W3JW VA FM17TN Gud strong signals from both stations with beams east. Very useable sigs with beams W and NW respectively. East-to-West shift on Connies signal was minimal (in the order of a millihertz). However on Marvin's signal, with the antenna direction change I saw a shift (up) in the order of 175 millihertz. In the case of Marvin's signal, I was using the typical single signal narrow span setup for Spectrum Lab. For Connie's two signal transmission I widened the spectrum lab window to encompass both signals and worked with the difference only (if I had been measuring Connie's signal with the "single signal" spectrum lab setup, I suspect I would have seen considerable shift in the signal during the period of the test. W6OQI LAX DM04vf It was fun to have a 20 meter FMT. I noticed Doppler on K5CM but slower moving than on 80 and 40 meter FMTs in the past. W7FU WWA CN87xo A new comer to FMT. Want to get into the game, so reduced the moving parts and used locally generated reference signals. GPSDO: SDR, synthesizer, and a swept AF SA on 'max hold' function. Thanks to the Connie and Charles for staging tonight's wonderful exercise. And thanks to Earl, N7EP, for all his mentoring. W8XN MI EN82DG Great idea for an FMT, many thanks! WA1ABI RI FN41jp Good signals from both stations. Thanks Connie and Marvin. WA2DVU SNJ FM29ob Good sigs - 20/9 no doppler for a change! WA6VPL SB CM94sq Submitted entry was made using K5CM ref tx on 14054500. Also, measured his ref tx with my own ref and obtained 14054499.380, 0.620 Hz low. Measured unknown with my own ref and obtained 14054689.129, again 0.620 Hz low. Oddly the two differences match. Is this Doppler effect or is my calibration off? W6OQI was very rough copy at this location. Using Spectrum Lab software to analyze the data. Example of how to measure the difference between two signals with Spectrum Lab. Although this technique works fine, It is best to average the entire period using SL to write the difference to a file every second or more. Using the averaging, the reading was dead on.